Many are aware of how the expression "snake oil" arose from certain products being sold in the American West of yore. If you are not familiar with this term, you can read about it here. Here it used as a title for this post because many believe or have read or have heard from others that all Elliott Wave analysis falls into this category : as a 'cure all' for market analysis that is nearly infallible. Because many, many people constantly challenge me in what they think are cogent arguments about the usefulness of Elliott Wave theory, I have decided to write this short perspective so I do not repeatedly have to address this issue. It takes too much of my time, drains my energy, and generally puts me in a bad mood to constantly address it during the trading day, or in chat rooms. So, I will do it here, and simply refer people back to this original work as needed in the future. Usually the people who make these arguments are only vaguely familiar with Elliott Wave work. 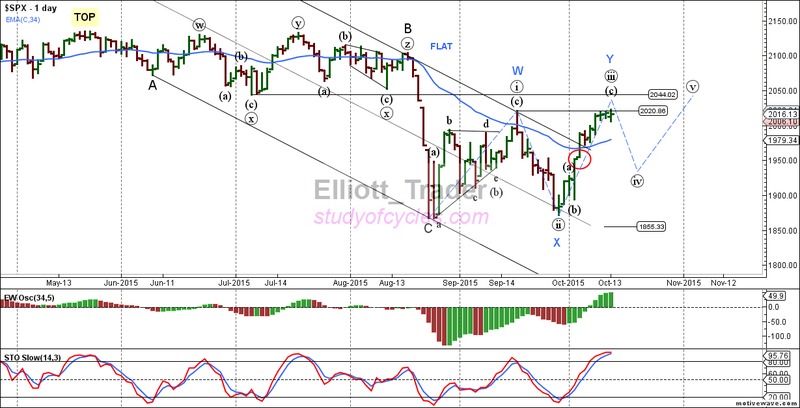 They may have read the Elliott Wave Principle (EWP) by Frost & Prechter, once. They may have understood some of it, but they haven't even committed the rules and guidelines to memory so they can see if they apply them real time. Then again, they may not have read it, the EWP, even once. If they are familiar with the work, these individuals may have full time jobs, and simply may not have had the time to try to apply it "real time" in markets. This clearly is not as inexcusable as someone who has not read the work with full understanding. Regardless of the knowledge level, these people are keenly aware of how one of the key developers and practitioners of wave theory has made some very bad calls. For this reason, they either see Elliott Wave Theory as 'useless' or, worse, actually 'detrimental' to market performance. And that is what those who argue against Elliott Wave theory usually use as the 'silver bullet' to end the Elliott Wave argument, once and for all, and for all time : they use someone's else performance. But, beyond that, usually these people have not read the more modern works on Elliott Wave theory. These works include those by Steven Poser, Glenn Neely and Bill Williams. Clearly, when Robert Prechter had his forecasting difficulties, others seeing 'some' value in Elliott Wave analysis tried to advance the work. In fact, the modern state of Elliott wave analysis includes all of these works. Glenn Neely, in Mastering Elliott Wave Theory, sought to quantify typical wave patterns and provide better realistic representations of what the common wave look like, than the EWP did. Bill Williams, PhD., is a master trader who has sought to make wave theory more reliable, not by throwing away anything in wave theory, but by updating it for the modern science of chaos theory, and by adding a relevant series of indicators to guide wave formation. I know what you're thinking. Hey, bud, I'm a trader (or investor) and I have to make a trade or make a decision. I need to be sure that decision is correct because it's my money. Well, my first response is, that's a nice goal : to make a highly reliable decision. But, to never make a mistake is a bit unrealistic. In fact, let's call it a pipe dream. In no other endeavor do people not make mistakes. Mistakes happen in business, they happen in war, they happen in marriage, they happen in sports. 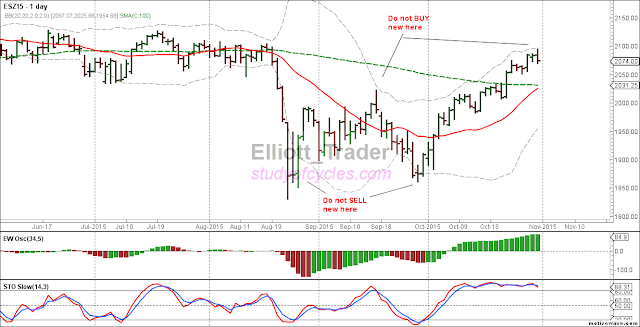 Why would we expect no mistakes to happen in market prediction? Yes, the fact that mistakes happen is why the issue of reliability in forecasting is an issue. Not all forecasts or predictions are 100% reliable : in fact, none are. To make this issue clear, I have taken them time to construct this graphic. Hopefully, it is a picture you can keep in mind. This chart shows how likely you are to be correct, if you make a certain prediction. For example, if you predict that the sun will rise tomorrow, you have greater than a 99% chance of being correct. That is because in more than the last 100 days, the number of times the sun has not risen has been exactly zero. But one day - for some reason - the sun will likely not rise. So, we can not say the chance is 'exactly' zero. But for all practical purposes it is 'near zero'. In a similar vein, the likelihood that you will awake tomorrow is also greater than 99%. In the last 100 days, if you are reading this, you have woken up every day. But one day, it is certain you will not. So again, the probability of waking up is near 100% - just not exactly 100%. I won't go through every example in excruciating detail. You know that local weather forecasts are now getting to be about 70 - 80% reliable for the near term. They 'can' tell you, for example, the chance of rain is 20%, tomorrow, for example, and be quite correct. The other examples are a coin toss - which you know is a 50 - 50 chance; predicting you will win at a game of solitaire about 17 - 25%, depending on skill; predicting a U.S. Citizen will never pay a dime in payroll tax - about 14% of Americans never have. Yes, an asteroid will hit the earth again - one wiped out the dinosaurs, but it does not happen at a frequency of once in a hundred days, thankfully, and, yes, 'some' day the sun will become a red giant star, or explode, based on the history of other stars. I won't go in to much detail now, but when an Elliott Wave impulse gets underway, it is the 'more' predictable of the patterns. There is 'better' than a 50:50 chance that it will have five waves, that the third wave will have the most momentum, that the third wave will have a price gap in it, and that the fifth wave will have less momentum than the third wave. Once a true impulse starts, there are only three ways it can form : an extended first wave, extended third wave, and extended fifth wave. This is useful information. Is it infallible information? No, it is not. What you do with that information is up to you. You can use it effectively or you can misuse it. By contrast, when an Elliott Wave correction begins it is the most notoriously difficult of the Elliott Wave patterns to predict. That's because the number of possible corrective patterns explodes enormously. There are sharps, which are zigzags, double zigzags, triple zigzags, and then there are triangles of several types (symmetrical & barrier contracting, and expanding triangles), and then there are flats of several types .. a few of which are regular flats, irregular flats, expanded flats, as well as double-three's and triple-three's. Because there are so many types of corrections, your ability - even as a knowledgeable wave trader - to correctly predict which is going to form is highly limited. Folks, let me be clear, this is just the nature of the game. It is a huge limitation. Yet, once a correction is over, just the fact that it is over and the type of correction that formed does, indeed, again provide you with more information. The information is there for your use, or again, your misuse. Geez - yet more problems? Readers knowledgeable of Elliott Wave theory will recognize that I did not even include the pattern termed the 'diagonal' in this discussion. 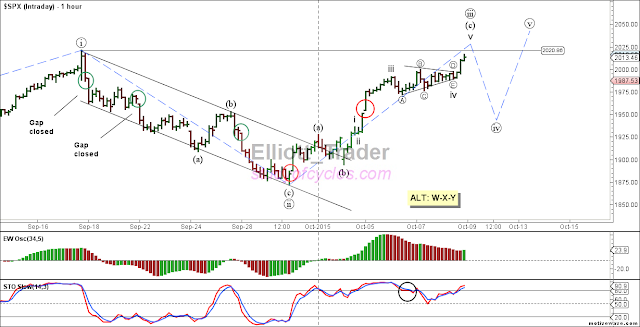 This pattern both increases and decreases the useful of wave theory in certain situations. Sometimes it 'definitely' signals the end of a wave, but sometimes, in a fake-out or not, it is really signalling the beginning of the next wave. And, then, there is the issue of "long range" forecasting versus short range forecasting. Just like the weather, it is much, much harder to accurately predict whether it will rain on June 21st in Miami three years from now, then it is to predict whether it will snow tomorrow. 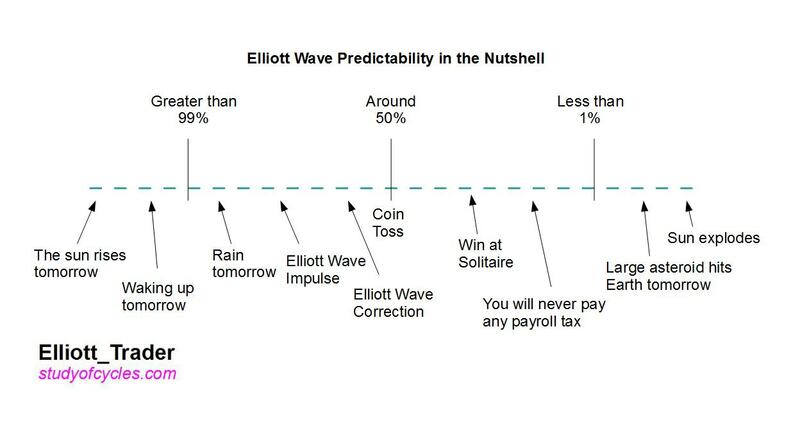 So, the more wave sequences in the future one tries to predict, the inherently less reliable the Elliott Wave forecast is going to be. So, let me say it again, predictions of Primary sized - monthly sized - waves, for example, are much more inherently difficult than predictions of minor sized - daily sized - waves. This, too, is simply the nature of the beast. From this discussion some readers can glean that if they truly understand wave theory - and not just some vague conception of wave theory - they might have the opportunity to make some more successful predictions than flipping a coin. To which some smart-alecks might just say, "too much work! I'll go with the coin!". And, the more short-term the prediction, the better chance it has or the fewer possibilities there are to contend with. And, yet, others might recognize that maybe it wasn't wave theory, itself, that resulted in the poor but highly recognized calls of an individual or organization, but maybe the specific way they applied wave theory. Maybe it was his, her's, or their desire for fame and personal excellence or maybe it was an organization's need to sell newsletters of dramatic consequences that led to the incorrect predictions. Which camp will you fall in? Will you recognize or not, that predicting waves is an exercise in reliability or probability, or will you just 'give up'? And will you recognize that modern wave theory is beyond where Prechter got it, or not? Most importantly, will you recognize that not only is it the theory, itself, but it is also the person using it, not using it, or misusing it that is also a factor in a successful prediction? That person is you! 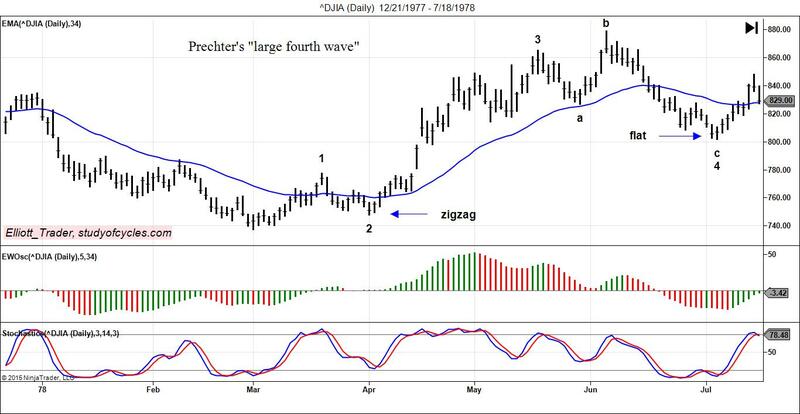 Large fourth waves are not only possible, they are documented, and they can lead to 5 = 3. So with yesterdays invalidation of any upward diagonals, the downward count changes to the count below, with minor waves 1, 2, 3 and 4 complete, and minor wave 5 in progress. This is the Plan B count that was shown before and now becomes the 'main' count. But a key issue involved in this chart is whether the fourth wave should be as large as it is, and I committed to review various materials and find out if large fourth waves make any sense. Reviewing Mastering Elliot Wave by Glenn Neely, Chapter 5-14, 'Realistic Representations' does, in fact, show impulsions with large fourth waves relative to their second waves when the third wave is extended. So, then the Elliott Wave Principle by Frost & Prechter was searched, and, in fact, Figure 80 on page 100 of the 2nd Ed, (which is the same figure as Figure 2-16 on Page 85 of the current 10th Ed), does in fact show a wave where the fourth wave measures much larger than the second wave. 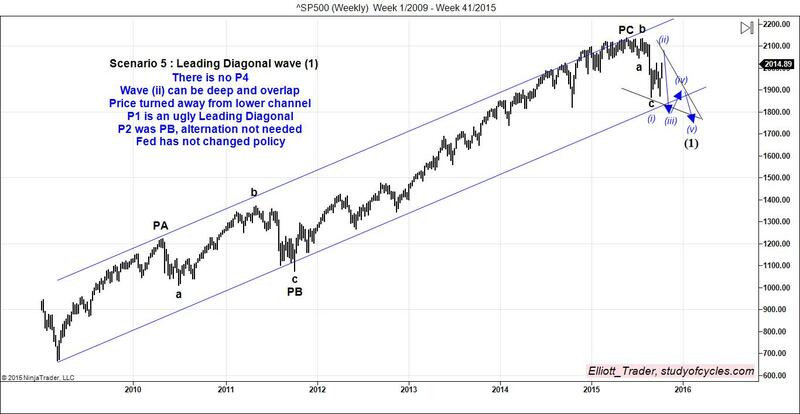 Using modern charting software, that wave is reproduced, below. You can see that the claimed fourth wave retraces 50 - 62% of the third wave. But in the Elliott Wave Principle, the next wave is cut off after only a very small portion of it, just like you see above, so it is very difficult to tell if a proper fifth wave was even made, or what occurred as a result. So, in order to check this out, the additional bars were added to the chart below. As you can see, not only was a fifth wave new high made, but the extent of that fifth wave is such that wave 5 = 3. Personally, I take this to be a real warning sign for those expecting a quick rebound after a brief new low below wave 3, the August 24th low, and another indicator that a primary fourth wave might be in real danger. Anyway, my commitment has been met, and I hope this information helps you in the days ahead. In yesterday's post, we raised the invalidation point for the potential contracting leading diagonal to 1953.45 because there were an initial five waves up, and they should not have been exceeded lower if the diagonal were to form properly. Later in the day, the five waves extended higher but into a three wave sequence with c = 0.618 x a, where 'a' was the initial five waves up. The raised invalidation level 1953.45 was taken out on the cash open this morning, so that level - and the only needed level - of invalidation occurred. There are several purposes now to this post. The first purpose is to clearly indicate that the second level of invalidation has also occurred. Since price is now below 1930.45, then a minute wave iv would now be longer than a minute wave ii. So, the upward contracting diagonal is as dead as it could be. The next purpose of this post is to also 'rule out' an Expanding diagonal for an up wave A of a Primary 4 triangle. The reason for that is that minute iii is 'shorter' in price than minute i. In an expanding diagonal minute iii would have to be longer than minute i, and it is not. In the weekend video, we contended that we would 'err' on the side of Primary 4 for a while, but the discussion in the video states that a Primary fourth wave is on 'shaky ground' because of the shallow Primary second wave. We also wrote in our posts that this daily count was a potential leading diagonal, and it would have to form properly. It did not. We have always carried the alternate of W-X-Y on this upward move, and therefore, there is no surprise or dismay at the invalidation. It 'simply' but entirely changes the picture from Plan A to Plan B. We gave the bulls a chance; they fumbled the ball. So, a lower low than 24 August is now expected. Next, we must confirm a five-wave sequence lower, to the lower low. 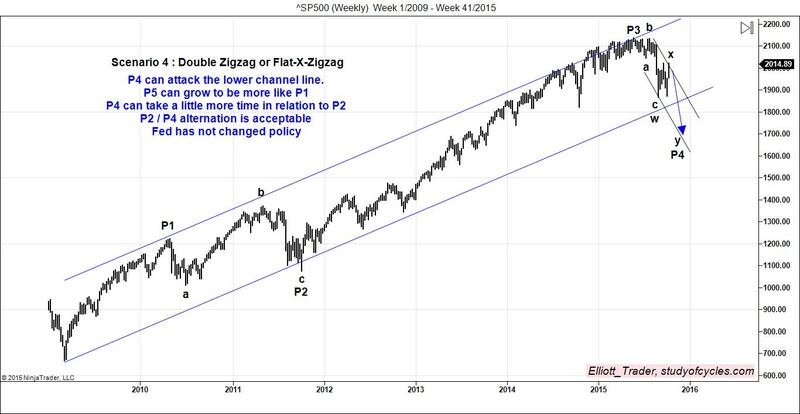 Those are not fully in evidence, yet, and a chart showing the invalidation of the prior diagonal is below. Please refer to the 20 Sep post for the Plan B details. However, if those five daily minor waves down occur in proper form, then we must also take a Primary 4th wave off of the table. This would agree especially well with what is occurring in the FTSE 100, as well, having overlapped it's first wave up after March, 2009. Again, we will only apply wave labels in accordance with sound Elliott Wave principles, as best we understand them, and attempt to show you this logic until it is clear. Below is a chart of the SP500 5-minute bars that was posted after market on Friday, which suggested we had A-B-C down to minute iv on the hourly chart of the potential upwardly contracting Leading Diagonal on the daily chart. The chart showed what is an impulse A wave, and a contracting ending diagonal C wave. This chart was criticized by some, saying, "you see too many diagonals and are probably just caught long and are trying to justify it. Too much of this behavior will cause your ruin, because that's what I used to do." Here is the updated chart as of this morning. The true intention of the chart was not the count relative to any of my positions. I don't have many 'nevers', but I try never to mix wave labeling with accounting. It was to explain the chop at the end of the session relative to the impulse character early in the session, and it appears to. While some may have been turned around, caught off guard or dismayed by the futures having been down -13 last night, only to turn around to be +12 by the time the market opened - this analyst was not. Many, many times the overnight futures do not leave their tracks in the cash market. And, while many times the futures do have an impact, a very good strategy is often to wait for the cash market open to see where things "really are". So, for example you could have watched the Packers beat the Seahawks in peace last night - as I did. So, do I make this post to make some hay of a short term rise, or for some other personal reason? No, the reason for the post is further analysis. 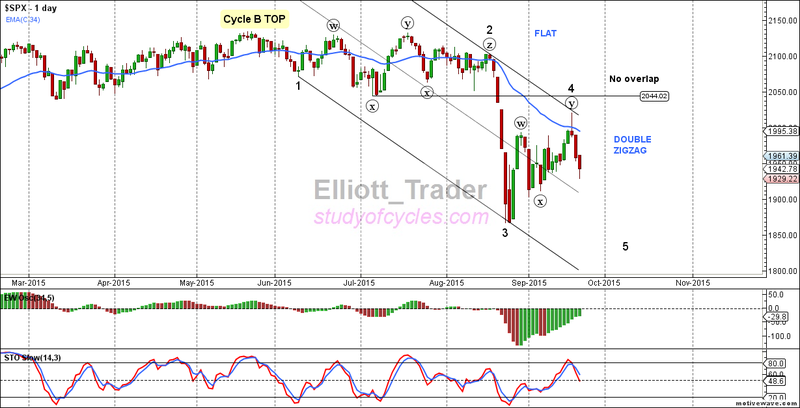 From the low of wave C we have had a "five wave rise" with a gap in wave three. That means the "invalidation point" for the overall contracting leading diagonal scenario now increases from 1930 to 1953, the low of the C wave. That's the way this process works. If we've just had - between the end of the session Friday, and early today - a five wave rise, it should NOT be taken out lower unless some other pattern is at play. So, let me say it again, the invalidation point for the hourly leading diagonal now rises to 1953. 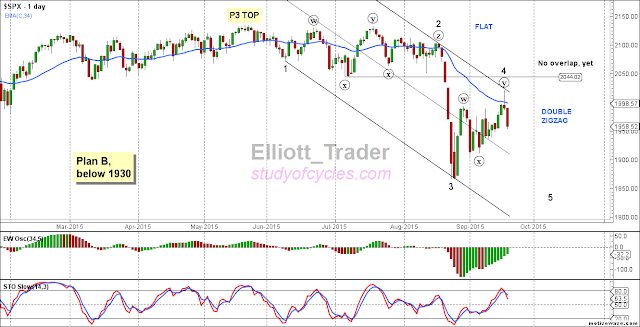 Considerable discussion in the September 19th post, below, shows why a Primary fourth wave is 'still' possible in US Equities. We have clearly done our jobs as Elliotticians of describing the 'main' count. This count is chosen for several reasons. Among them are the following: 1) At the monthly level, trend in equities is still 'up', with higher monthly highs and higher monthly lows. 2) At the weekly level there is a curious and suspicious divergence between the DOW and the S&P500 Index. 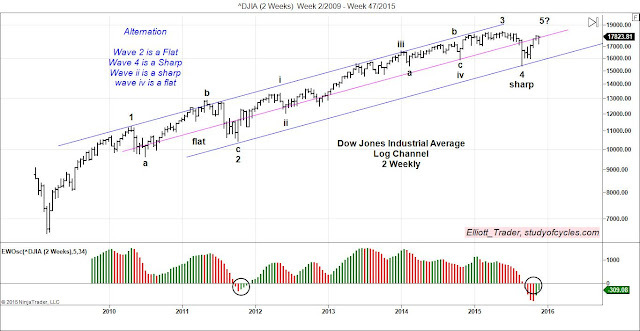 Why hasn't the SP500 made a lower weekly low, as the DOW has? Is the SP500 trying to signal that a Primary fourth wave is truly ahead of us? 3) At the daily level, short term the 'recent' trend is up, with higher daily highs and higher daily lows, and we don't like to 'fight the trend'. 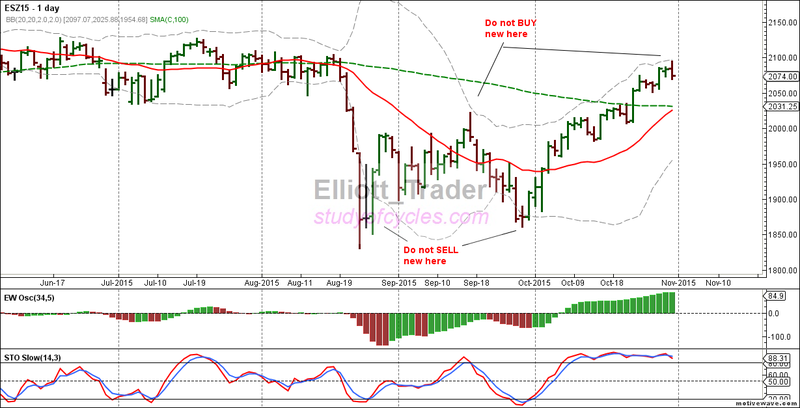 Longer term, we must agree the daily chart could convert to full-on bearish. 4) At the hourly level, there is a good possibility of a contracting Leading Diagonal, and 5) at the five-minute level there is a possibility of a contracting ending diagonal C wave - meaning higher prices could result from the 'bullish falling wedge pattern'. So, those are the reasons for judging that a Primary fourth wave is 'possible'. And, to that end, we have provided a very 'clear' and unambiguous 'invalidation point', based again on sound Elliott Wave logic, where that pattern would invalidate.That level is below 1930, in the cash SP500 Index. 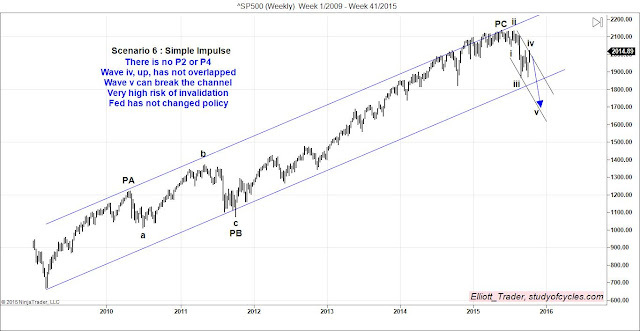 Yet, we have been a very vocal advocate that Elliott Wave reasoning is an exercise in 'probabilistic thinking'. For many counts there is a very good 'alternate'. Furthermore, no one has yet asked, "what is one to do if the invalidation point is hit?" Well, here again, we have been vocal advocates that if trading is looked at as a business, one should always have a plan B. What else are we to do as traders? Take our ball home and exit the game in shame? Having an equally well thought-out plan B should be looked at with no more stigma than when, say, in a football game, the quarterback decided at the last minute to keep the ball and run for the first down, versus the original plan of passing that ball, but the receivers were covered this time. That's it. That's all. The point of the trading game is to make and keep profits. 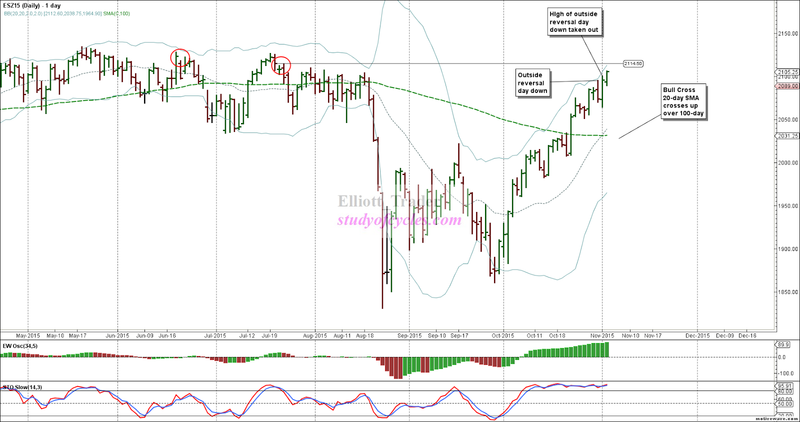 Once one gets the longer term trend of the market correct, then that will likely happen. We are currently in the price-discovery phase where the market will tell us which path it plans to take. With that in mind, without any apology, but actually with the best intention of preparing myself, this chart of Plan B is offered. This count counts all of the previous waves to the August bottom as the same; 1, 2, 3 are exactly equivalent to A, B, C in the 'main' count. In this count there certainly is no overlap of wave 4 with wave 1, and wave 4 does not encroach even upon wave 2 territory. 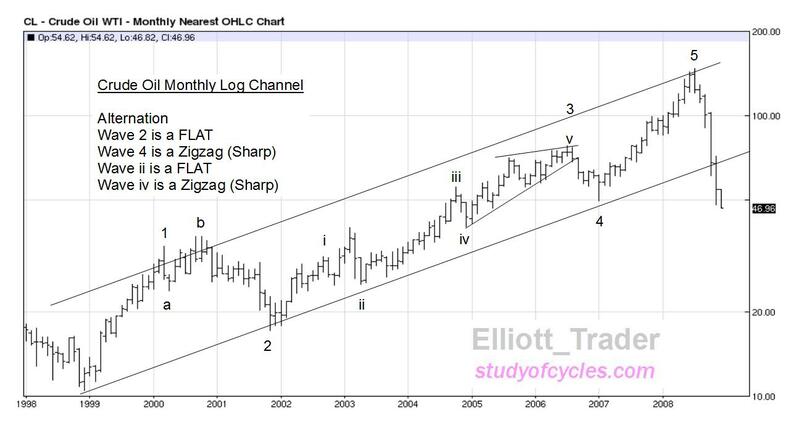 There 'would' be good alternation, if it occurs this way, because if wave 2 is properly seen as a FLAT, then wave 4 would be properly seen as a double zigzag. Furthermore, every numbered wave occurs on alternate sides of the EMA-34, thus providing good form and balance. The only significant objection to this count is that wave 4 is quite a bit 'larger' than wave 2, and 'usually' it is smaller. Right now, I don't know of a 'rule' that prevents such a thing - as long as wave 1 is not overlapped. But I will go back through some of the guidelines of wave formation and review this situation to see if it is a critical objection or not. There is also one minor objection to this count : right now the waves form a suspiciously 'perfect' channel. So, the count may still be corrective. 'Usually' impulse waves have 'some' sloppiness in their channeling. Wave three's in particular tend to exceed channel boundaries. Again, this is not a 'deal breaker', but it is 'something' to keep one's eye on. Right now, this is the very best alternate I see. And, an impulse wave lower, would most likely, turn the overall tide of the market lower. Importantly, we do not want to be caught on the 'slope of hope', hoping for a Primary 5th wave yet to follow when the market does intend to head lower so it is very important to listen to the market's message, and below 1930, cash S&P, the game takes on a different character. If a minor wave 5 were to occur lower - in opposition to the main count - then it would likely stop on the mid-point of the channel line. But, again, right now, there is no price evidence for that, so that is getting ahead of ourselves. Successfully predicting the formation of an Ending Contracting Diagonal beginning in late December, 2014 in my YouTube channel and watching it form successfully through May, 2015 was both an emotionally exhilarating and emotionally exhausting experience. In case you are not familiar with the prediction, it appears below, as it was made. It was exhilarating, of course, to see such a prediction come true, but it was also exhausting because of the rampant bullishness at the time, with some people making much higher price projections. 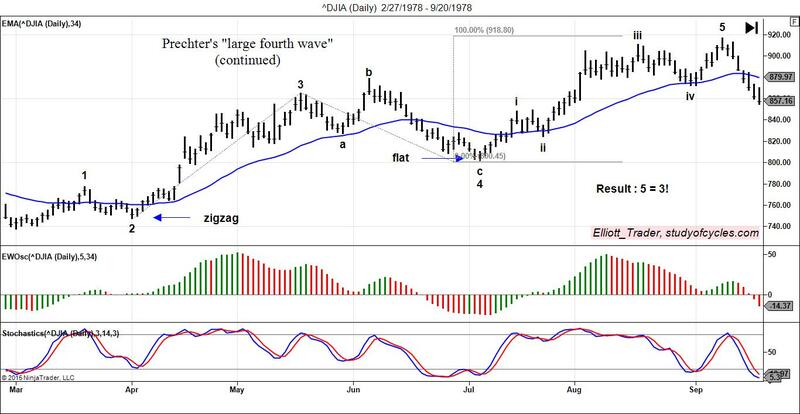 Few people on blogs and web-sites thought this pattern would end or interrupt the bull market, and it was very exhausting trying to communicate with others - showing with sound Elliott wave logic - how their own reasoning could be off. Many refused to accept the idea but were forced to, as, day-by-day, prices headed lower. Stocks topped, at least temporarily in May 2015. The $DOW and $NYA have since made lower lows than the wave shown as circle-4, above, validating that a true diagonal occurred. The S&P has not, yet. It may or may not. But overall, one certainly has to have gratitude for this degree of foresight. Most people are now familiar with the water-shed decline in prices that occurred in August, 2015. 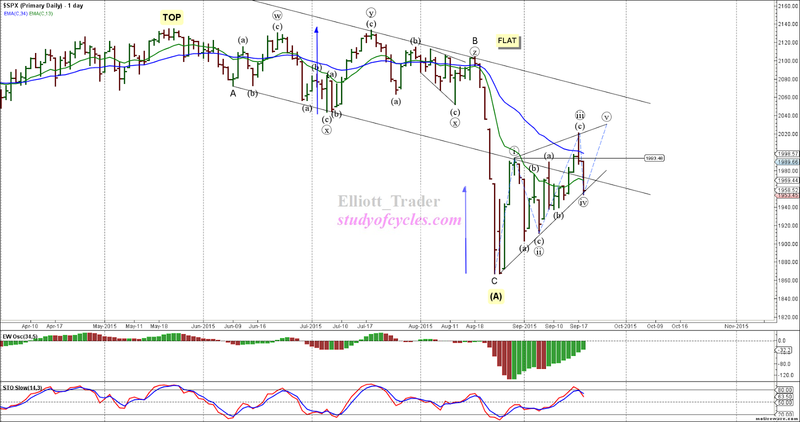 This daily chart will show that decline and subsequent wave action. 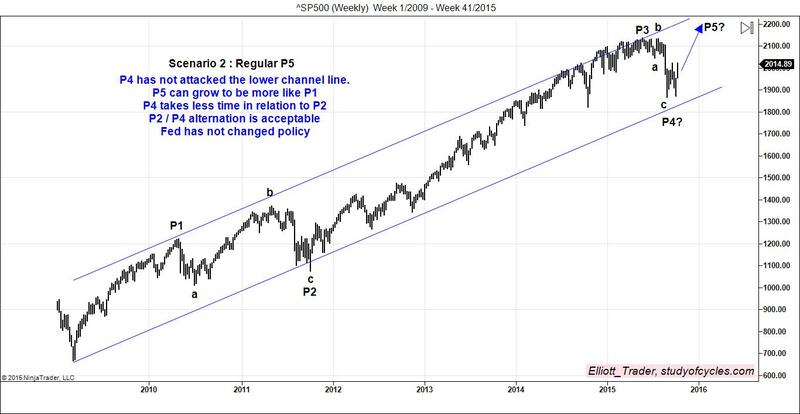 Once again, it is important to try to apply sound Elliott Wave logic to this count. The logic goes as follows. IF the top was actually the end of a Primary-C wave, as certain publications have suggested, then by this time it should be 'exceptionally easy' to count five-waves lower from the top. I have tried that already. I could see where after the August decline, which some count as a third wave, there could have been a regular symmetric or barrier triangle to form a fourth wave, and that simply did not occur. Let me say it again. I 'tried' to count it that way. I expected it to happen. The market said, "sorry charlie", and was more bullish than a regular triangle. So, I 'will' listen to the market. 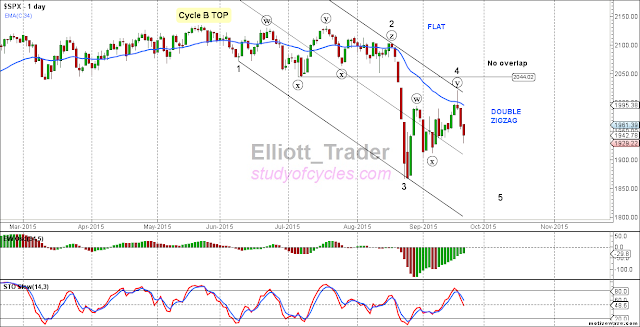 Some say, well the fifth wave down is actually the truncated wave that did not make a lower low at the end of August. Wait-a-minute! IF we had Primary-C up to May, and are starting a 'major decline' why are we having to invoke a truncated wave this early in the downward count?! That doesn't make sense and it questions the 'impulse down' theory. 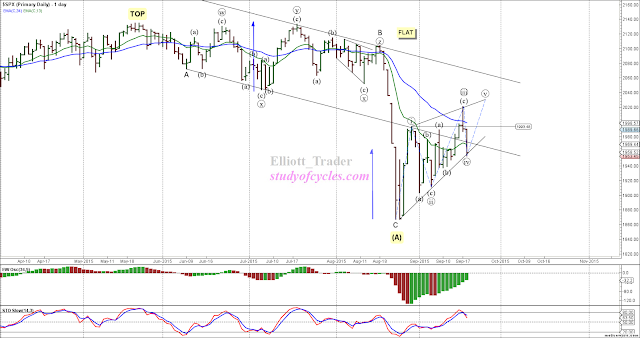 But, furthermore look at the structure of the first wave down in June - the wave labeled as minor A. This wave clearly 'doesn't go anywhere', it doesn't even make a new low over the May low. This is often a sign of an "A" wave, and not a "1" wave. Next, the choppy sideways movement that goes until mid-August can best be counted as one unified - albeit complex - sideways flat wave. Why? Well, it has a lower low at circle-x, and a higher high than circle-w at circle-y. 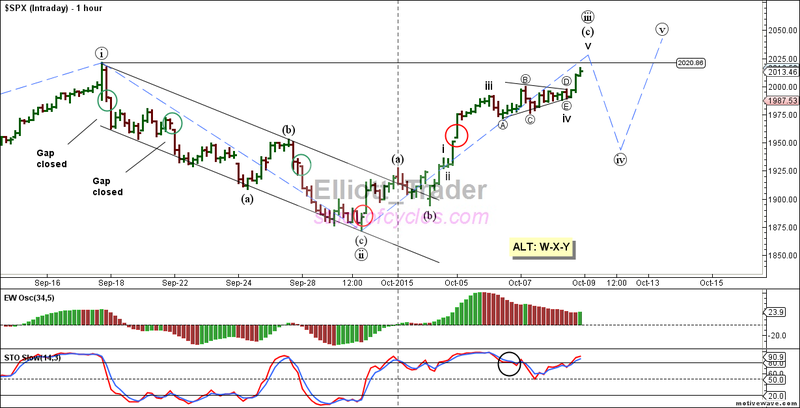 Next, subsequent down waves (a) and (c) ALSO do not make lower lows. The very hallmark of motive waves in a down trend is that they make lower lows, and these do not. So, as far as I can tell, the B wave is a sideways flat, until middle of August. But that is the next problem for the "impulse down" theory. "Most often", a second wave is in the "sharp" category of waves - meaning either a zigzag or multiple zigzag. Clearly, thinking in terms of probabilities, this greatly reduces the probability of a second wave at this location. So, B wave it is. Then, there is the watershed wave downward. It does 'in fact' have all the characteristics of a "third" wave. But, C waves are in the "third position" also, as the Elliott Wave Principle, by Frost & Prechter, clearly points out. So, when I add all of this together, it points me to think we have had an A-B-C down from the top, even as powerfully down as that end of August wave, down, was. Then there is channeling. If you have not studied many 'true impulses', there is an observation by keen Elliott Wave technicians, like Jeffery Kennedy, that, in a true impulse, waves 1 & 2 often form the "base channel", and wave 3 will break it to the down side. That base channel is shown on the above chart (just drawn between A & B, as if they were 1 & 2). The prediction from "base channel" theory is that wave four will refrain from re-entering the base channel. That is because wave fours tend to be rather weak and sideways structures. As you can plainly see from the chart, above, recent price movement has, in fact, re-entered the base channel. This actually tilts the chart from bearish to 'somewhat more bullish' because of that. That is one of the factors that changed my view of the current daily waves from a regular contracting or barrier triangle to a more bullish triangle - the contracting leading diagonal triangle. 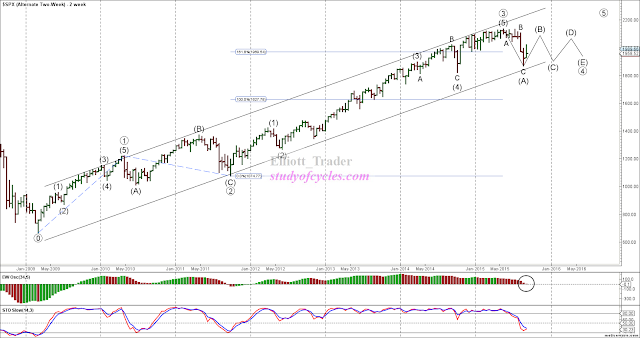 So far, all of the predictions for that leading diagonal have come to pass, including the higher wave minute-iii (circle iii) which occurred even as others were predicting much lower stock prices at the time. Next, there is the "size" of this overall wave. Because some commercial Elliott Wave services still say, "well, the top is likely in, but there is one way for the market to rescue itself", it means that Primary 4, now, rather than Primary C at the top, is still on the table. There is no getting around it. Do I like that situation of uncertainty - heck, no. But, as market technicians, we must 'deal with it'. 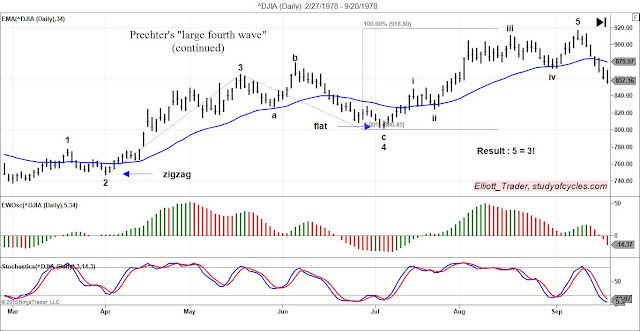 In fact, if we have had "three waves down" A-B-C to the August lows, that is the 'worst imaginable' situation there could be for an Elliott Wave technician. In my YouTube video, "A Critique of Elliott Wave Theory for Trading", I describe that there are thirteen (13), yes, thirteen, legitimate patterns that can form from three waves down after a third wave up of an impulse has formed. A triangle is among those patterns. So, when I next look at the fact that Primary 3 (if that's what it is) did indeed pass the 1.618 Fibonacci extension, as I measure it, then this says, regardless of the shallow decline in Primary 2, that the May, top, could , indeed, be Primary 3. BUT, if that is the case, how many months and months did that wave consume?! Fully 43 months by my count! Is it then reasonable to conclude that decline of only five months will correct a rise of 43 months??!! It just doesn't seem likely, so I don't think so. 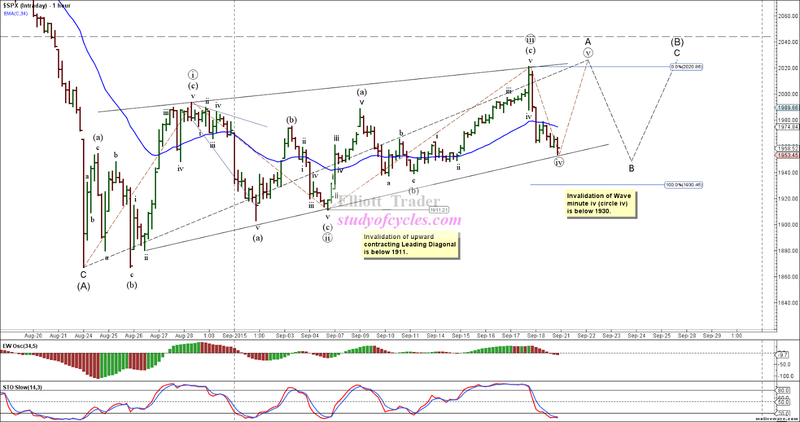 Again, it is just wave logic that is telling me this correction may go on much longer. In the chart below, I have sketched in a plausible scenario - that Primary 4 takes up much, much, much more time in the form of a triangle. The five waves of the triangle must be Intermediate waves, shown properly as (A), (B), (C), (D), & (E). That is because it takes intermediate sized waves to make up a primary sized wave. 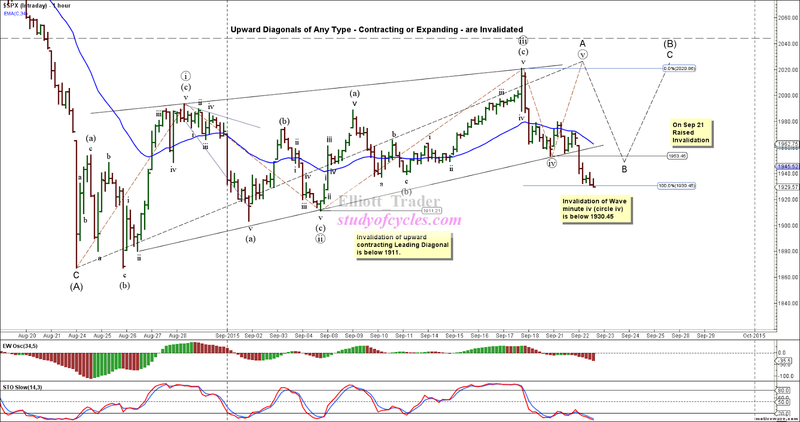 Backing up to the current waves down from the May high, that means they are Minor sized waves, making up one intermediate wave, lower, intermediate (A) of the potential triangle. Next, let's ask what a triangle represents. A triangle is a "pattern that moves prices sideways and takes up time. It represents a 'balance between the forces of buying and selling' and is often characterized by lower volume and indecision'." From an economic viewpoint, isn't that what we are seeing from the Fed? A complete lack of decision on when to hike interest rates? And isn't that what we are seeing from many, many wave pundits? Is it A-B-C or is it P1 - P3? Many wave followers describe themselves as confused. This situation both demonstrates and creates more indecision. But further, many are probably giving back profits that were earned sitting long in P3 as the "whippy-ness" of the current market environment chops accounts around. This is characteristic in a triangle. The whippy, choppy action is something which has been foreseen. It could last a while. Lastly, it must be said, we have no infallible view of Elliott Wave theory. We know things change. We know there are news announcements we can't foresee. How then do we know when the "pretty picture" above, is incorrect? Well, let's look at a short term, hourly chart. 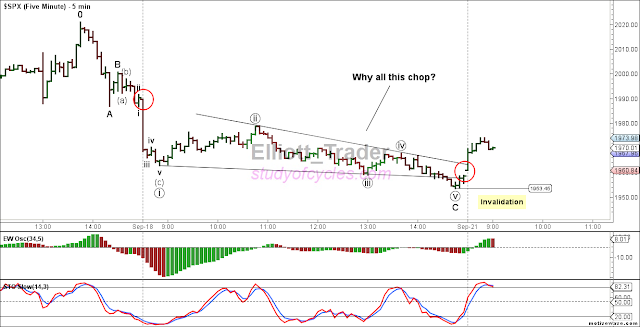 So, we have been following this hourly pattern on the SP500 cash. From the August 24th lows, there is a clear pattern of higher highs and higher lows - the very definition of an up trend - at least short term. So far, the pattern looks like a contracting Leading Diagonal, with each numbered wave on an opposite side of the EMA-34 for good form and balance. Wave minute iv may have completed at Friday's low. For a contracting Leading Diagonal to form properly, wave minute iii must be less than wave minute i, which it is; wave minute iv must be less than wave ii - which it is currently. Wave minute v must be less than wave minute iii, and wave minute iv must overlap wave minute i - which it has already. But, to maintain it's integrity as a Leading Diagonal, wave minute iv, we said, must be less than wave minute ii. Using a Fibonacci ruler, we can calculate that this pattern would invalidate below the low of 1930, because then a wave minute iv would be longer than wave minute ii and that is not allowed in a contracting leading diagonal. In addition, wave minute iii may not travel below the low of wave minute ii, but that level of invalidation has held, already, so the 1930 level takes precedence. So, that's what is here - on the charts. What is not on the charts is also of some very great importance. 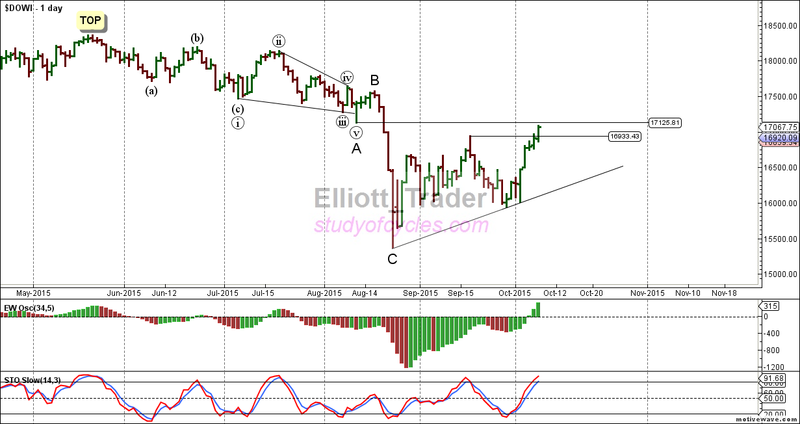 There is no major commercial wave service I am aware of, or dedicated Elliott wave blogger, who has drawn a triangle pattern in the waves prior to May, 2015. 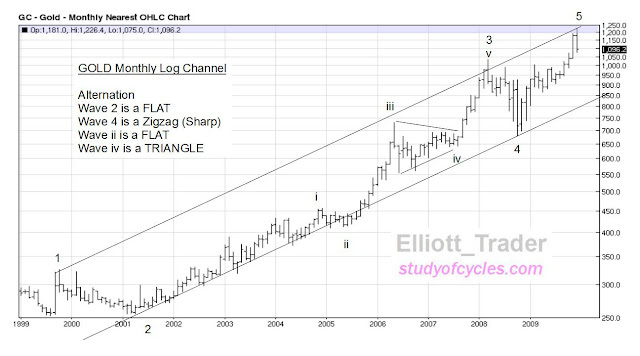 This is very important because most technicians know, and Elliott Wave technicians almost always look for a triangle pattern to appear before the last wave in a sequence. That hasn't happened yet, and so we have to ask "why not?". Perhaps it is because the triangle will form as Primary 4. That would make the last wave Primary 5. So, there you have it. We have tried to put the whole package together. 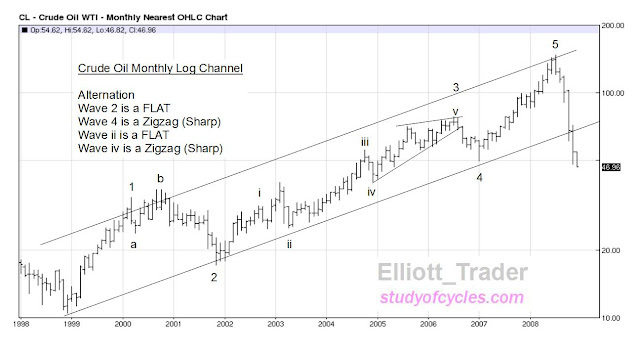 From Primary counts, to Intermediate Counts, to Minor Counts to minute counts, using sound Elliott Wave logic. This may read in a boring manner. It's not as cute as pasting pictures of bears or bulls devouring something. We hope it is, in fact, something useful, and the type of analysis that doesn't cause you to jump out of your thirteenth floor window when you read it or receive the newsletter.